The L.A. County Fair is back, marking the start of fall. It’s time for fun rides, games, cute animals, concerts and food — lots and lots of food. Think giant turkey legs, deep-fried Oreos, funnel cakes, corn dogs…you get the idea! The fair runs from Sept. 2 through 25 in Pomona and here’s how to get there with Metrolink or Foothill Transit. 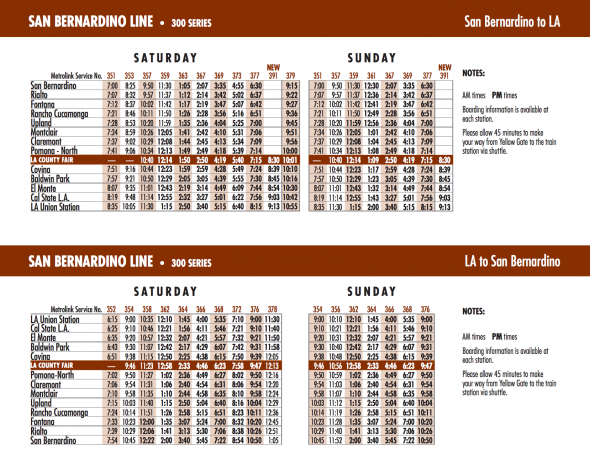 All of Metrolink’s San Bernardino Line weekend trains will stop at the Fairplex station, a special stop by the fair, except for trains 351, 352 and 353. The San Bernardino Line connects with Metro Bus and Rail at Union Station. Additional weekend train service on the line means you won’t have to rush through dinner; last trains will depart the Fairplex station at 10:01 p.m. on Saturdays and 8:30 p.m. on Sundays. To get the most bang for your buck, buy a $10 Metrolink Weekend Day Pass and then get discounted L.A. Fair tickets online by using the promo code METROLINK. Foothill Transit has a new bus line that will get you to the fair on weekends. Line 196 runs on weekends and Labor Day only and travels between Azusa and Pomona. It stops just outside the fairground, where you can connect with a free fair shuttle. The bus also connects with the Metro Gold Line at the Azusa Downtown Station. Foothill Transit bus fare is $1.25, and transfers from Metro cost $.50. You can pay using stored value on your TAP card. And last but not least, Foothill Transit riders can receive a discount on L.A. Fair tickets when purchasing online by using the code FOOTHILL. The L.A. County Fair is closed Mondays and Tuesdays. Please check here for fair hours. It might be helpful to mention the location/address of the Fairplex station. Metrolink site has no info either. 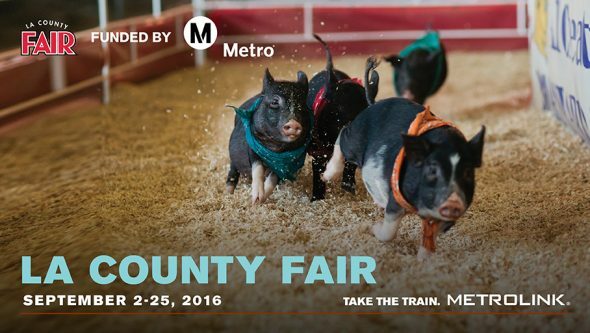 Can Metrolink and/or Metro be used on weekdays to get to the fair? Tickets are cheaper and crowds smaller then! You could take Foothill Transit Line 197 from Downtown Pomona Metrolink or walk a half mile from North Pomona to Arrow Highway, or catch a taxi or ride service vehicle from the Metrolink to the fair. They used to have the Thursday and Friday Metrolink trains stop in the afternoon at Fairplex but the regular riders got annoyed by the extra time to drop off a few people. Yah, Pomona is a major PITA to get to from most of LA County on public transit. The MLNK San Bernardino Line has some OK options M-F. The constraining factor is the last train back to LAUS (337) leaves Claremont at 7:47pm; no late night at the Fair! Increasing MLNK Riverside Line service is a theoretical option but the host railroad would never allow it. I agree that Metro should step up with some express bus service direct to Pomona and the Fair – Silver Line extension, anyone? That poster would make an awesome tap card!!! The O.C. Fair has much better express bus service from all over the county. Time for L.A. to catch up !